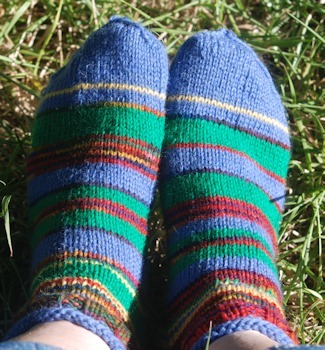 Finally got the new set of striped shorty socks off the needles around midnight last night. Am now slowly weaving in the ends. The blue, red, and yellow colors are close to "right", but the green is much deeper, more saturated. If I'd had this shade of green, the socks would have been pretty that way too, but it's not how they really look. I don't know what it is about my camera that does not render this color accurately on its standard setting, but it did the same thing with the first regular (nonstriped) socks of the various greens...this particular green, so vibrant in reality, comes out looking paler, less saturated. 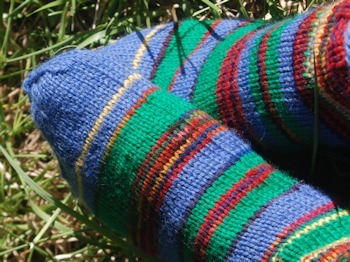 I see the yarn color as a rich, saturated emerald green--just a little bluer than the green in the first striped socks, but that "solidity" to it. It's not a color that would make you think "medium green" or "light green" as the sock images might, more like the color patch shown here, but "brighter" (yarn always seems to ahve more intensity than a color patch on the screen. The socks on the left were the yellower green; the ones of the right (with the rose-colored toes) have this same green as the new socks, but once again it showed up much lighter in the picture. It looked almost right in the picture I took of the partially completed sock several posts ago. Aside from that, here are the yarns used: Color one, a light "dusty" blue is Ella rae Classic #45. Color two, the green under discussion, is Ella rae Classic #90. Color three is Mountain Colors Bitterroot Rainbow, the handpainted yarn that showed up as red, blue, purple, orange, green or a dusty pink. Color four is Cascade 220 Superwash #821. I used up all my leftover of the blue, and had to break a new ball to finish the toe of one sock. (Had previously striped the first pair of shorties, and also put some stripes on the Sunset Canyon pair. I still have leftover green. I used up about 25 yards of the Mountain Colors handpainted yarn per sock, and about 4-5 yards of the Cascade 220 yellow per sock. I like the way the colors show through the gaps in the sandals, but more than that how cool they are when riding...wool's excellent wicking plus the slightly "standaway" cuffs and the sandals' ventilation means my feet stay very comfortable even riding in 95F weather. One more pair of these shorties and I'll have a full week's rotation with them. But first...weaving in the ends. Then into the rotation they go. Cool, we have similar sandals. Mine use Velcro rather than laces. I think I need to learn to knit. 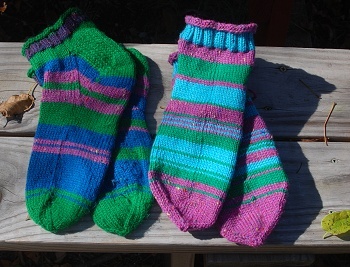 I've tried crocheting socks but they come out too thick for summer wear, even using the lightest weight yarns possible. As you can see, probably, I use fairly thick yarn--it insulates me from the heat of the street (which here can be fierce) and cushions my feet as well. With the standaway cuff, pedaling literally pumps air through the yarn, but cooling it on the way because of the evaporation. I was surprised that this worked; I hadn't planned for that specifically. Sandals let the air in; the cuff and the movement of my foot lets it out. If I had thought it up that way, I'd feel much smarter. But it was not that planned. Anyway, I think knitting makes a more comfortable sock fabric, and you can also knit more open parts of the sock, if you want. 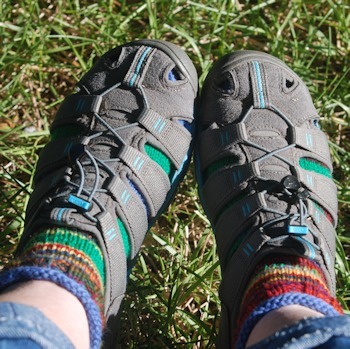 The thing to avoid for summer socks (IMO) is a high, snug ankle. Nice to see the finished result. These might possibly be my favourite (along with the super bright red pair you made early on in your sock adventures). Sorry , the Serranoverse comment was mine!